Alanis Morissette Lyric Day - Listen to "Jagged Little Pill Acoustic"
Every so often my iPod kicks a little unexpected awesome my way (it's not especially easy, since my iPhone has space for less than half of my music library, so I generally know what I've selected to load onto it), and last night it was on a particular roll. 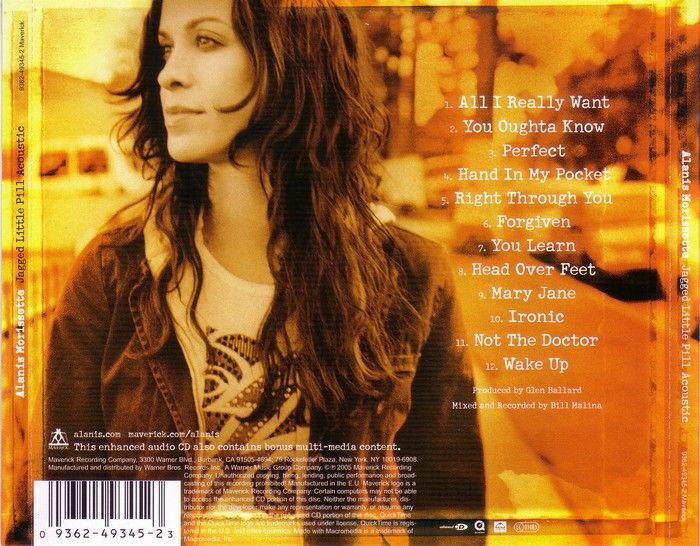 One of the delightful blasts from the past was Alanis Morissette's ever-quotable "All I Really Want," the opening track on her blockbuster breakthrough album Jagged Little Pill, an album to which just about everyone who was alive and musically conscious when the album landed in 1995 knows at least a handful of lyrics (if not every word...*cough*). Case in point: a Facebook status update I posted upon hearing the tune ("Why are you so petrified of silence? Here: can you handle this..." One of my all-time favorite Morissettisms) inspired several continuation replies from high school friends I'd not heard from in a good while. More updates and replies and reunions followed until I decided that, if there ever were to be a day dedicated to the nostalgic recitation of some of the famous words caterwauled our way fifteen years ago by a nineteen-year-old former Canadian dance music singer (or the many more that have followed since across five studio albums), there seemed to be no reason for it not to be December 17, 2010. For inspiration, listen below to Jagged Little Pill Acoustic, recorded in 2005 to celebrate the tenth anniversary of the initial release of Jagged Little Pill; on the new record, Morissette performs new, (relatively) acoustic, and accordingly mellowed renditions of all thirteen tracks from the original release, with original producer - with some surprising and some downright transcendent results. It's a fascinating before-and-after piece that differs from the teenage angst of the original to the extent the then 29-year-old Alanis, at the time engaged to Hollywood hunk Ryan Reynolds (the pair called off their engagement in 2007), differed from the precocious, angry/bruised teenager on the first record. If someone had told me that I might one day play Jagged Little Pill to soothe my senses to sleep I'd have laughed aloud, but if you haven't had the pleasure, give it a go. After all, it's Alanis Lyric Day! Swallow it down. It feels so good. If you like what you hear, pick up part or all of Jagged Little Pill Acoustic on iTunes or Amazon, so we aren't such thugs for streaming it here for you for free. * ironic (adj. ): in the song by Alanis Morissette, used to describe an unfortunate circumstance, particularly one with seeming cruelty of chance; not to be confused with an actual definition of the word. I love Alanis' JLP album and your site of course..."it's a free ride, when you've already paid"
On a side note. May I ask you a question that pertains to blogging? I just recently started blogging and have been exchanging links with other bloggers. I found that my the thumbnail pic of my blog does not show up in other peoples blogs. Do you have any idea how to fix it? Thanks for any help.